CLEVELAND — John Booth drives for Uber full time. "By last Friday, I just hit 15,000 rides in three and a half years," Booth said. The Uber driver said he works strategically, mostly during what Uber calls "surge times." "When the demand goes up, if there's no drivers available, the price goes up, therefore it attracts more drivers to come out and drive," Booth said. Booth recently got an email from Uber about surge pricing changes. Instead of drivers getting a percentage of those more expensive rides, they will now get a set dollar amount. "Under the old model, the driver would have made about $23 after the airport fee and the booking fee and the split, now its going to be about $15," said Booth. 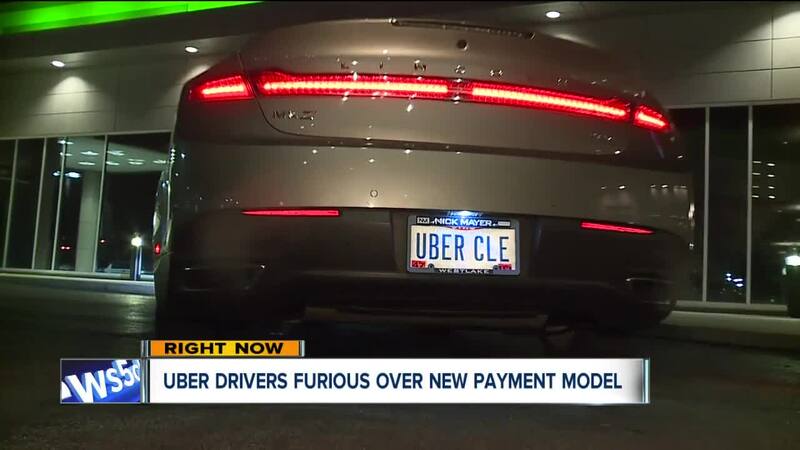 Now when you call an Uber during a high-profile time like a weekend evening or after a big concert, you'll still be charged more, but Cleveland Uber drivers say they'll get much less. "And not to say its a money grab to bad mouth the company, but it looks like its a money grab," Booth said. "I haven't really out a pencil to it yet, but I would imagine that's going to wipe out $800 to $1,000 a month." Booth said not only will this diminish his salary, he's also worried about the riders. "The full timers were the ones that depend on that extra money cause we drive all the time and I think it might seriously hurt the quality of service," Booth said. We are testing changes to surge, designed to make it a more reliable way for drivers to earn extra money more often. We are always looking for ways to improve the earning experience for drivers. Booth said he's not experiencing any benefit to the new policy. "I could understand maybe and I think all the drivers everywhere could understand maybe if they weren't basically charging the passenger the same rate, if it was less as a whole all around, OK it is what it is, but its not," Booth said.